Did Geoffrey Chaucer invent Valentine’s Day? Yes and no. But Valentine’s Day only became associated with romantic love during the late fourteenth century, when Geoffrey Chaucer (c. 1343-1400), author of The Canterbury Tales, made the association in his poem ‘The Parlement of Foules’, written some time in the 1380s, possibly in 1382. The poem features a parliament, or assembly, of birds, which have gathered together in order to choose their mates. As Chaucer’s narrator remarks, ‘For this was on seynt Volantynys day / Whan euery bryd comyth there to chese his make.’ However, several of Chaucer’s contemporaries also wrote poems about Valentine’s Day as a day for lovers, among them John Gower (author of the colossal Confessio Amantis), John Clanvowe, and Oton de Grandson. Chaucer was perhaps merely the poet who popularised this new fashionable notion, although there is some evidence to suggest that Chaucer was probably writing slightly earlier than these three other poets. But when was Valentine’s Day in Chaucer’s poem? The modern reader is likely to assume Chaucer is referring to 14 February, but critics and commentators have pointed out that mid-February is an unlikely time of year for birds to mate, at least in England. Artistic licence is obviously a factor here, and 14 February was already established as the Christian feast day of Saint Valentine. And yet some scholars, Henry Ansgar Kelly among them, have proposed that Chaucer was actually referring to 3 May, a date on which Valentine of Genoa, a bishop who died around AD 307, was commemorated. Chaucer wrote a poem about the coming of summer which contains the lines, ‘Saint Valentine, that art full high aloft, / Thus singen smalle fowles for thy sake’. Given that this poem is about the arrival of summer, early May seems a more likely date for this St. Valentine’s Day than mid-February. Another fact adds credence to the 3 May theory: it was on this date in 1381 that the engagement of Richard II (Chaucer’s patron) to Anne of Bohemia was announced. Chaucer possibly wrote his poem the following year to mark the one-year anniversary of the betrothal. So perhaps Chaucer ‘invented’ – or at any rate helped to popularise – Valentine’s Day as a day of love and romance. It’s just that he possibly had a different date marked on his calendar for Valentine’s Day. You can read a modern translation of Chaucer’s poem here. 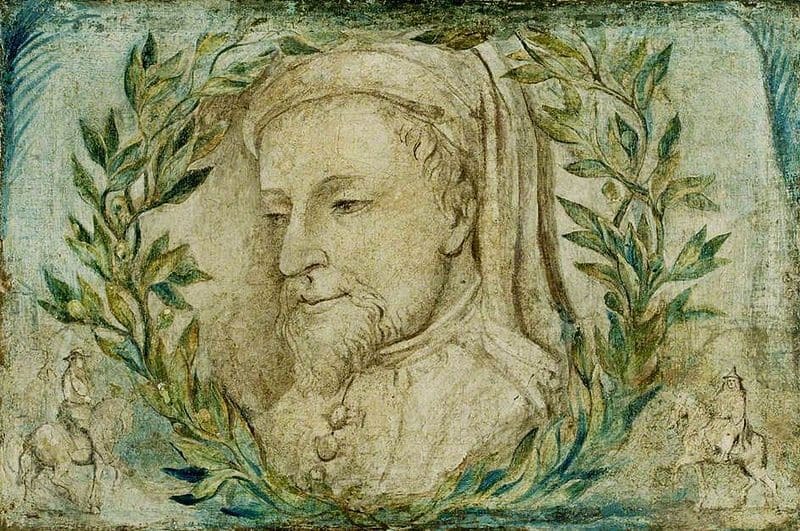 Image: William Blake – Geoffrey Chaucer – Manchester City Gallery – Tempera on canvas c 1800, public domain. Great to know this background. Thanks for posting! Actually, Valentine’s day has nothing to do with Chaucer or Christianity. Most all the holidays we celebrate have roots firmly planted in pagan beliefs. This day is no exception. I’d love to hear more about this, Wordman. It was my understanding that there was no evidence for Valentine’s Day having its roots in pagan ritual, other than the coincidence of the dates (Valentine’s Day and Lupercalia). This is suggestive, but hardly conclusive. Someone recently told me about Valentine’s day’s pagan origins as well. But after reading Mr/Ms interestingliterature’s comment below, now I’m completely unsure as to how to imagine the origins of Valentine’s day! I think it’s a difficult issue. ‘Valentine’s Day’, as in a late winter festival of mid-February, almost certainly shares something with earlier pagan festivals (like Christmas, Easter, and Halloween), but when we think of the modern Valentine’s Day we think exclusively of love and romance, and that’s where Chaucer and the poets come in, it would seem, in the late Middle Ages and the Renaissance: http://ancienthistory.about.com/od/valentinesday/p/021098Valentine.htm. Good old Geoffrey! Happy Valentine’s day to you, too, Dr Interesting Literature! You were wondering, weren’t you? Before ‘the weather’ (there’s a phrase that’s going to last!) I’d noticed birds gathering nesting material: January. Depends on how mild the Winter – Feb 14th quite a probability. Anyhow,May is way too, that is, way too late for the first mating of the year! Thanks, Michael. I think you may have a point about the birds (I confess I don’t know enough about these things). One other thing to take into account, which supports what you say here, is the difference in the calendar – Chaucer was writing under the Julian calendar, so ‘his’ February 14th would be nearer the end of February by the modern Gregorian calendar, and by late February, I assume (you can probably confirm this) birds are usually mating! I agree with michael9murray. The bird courtship goes on for weeks. First the birds gather, in my area (New England, USA) after their migration. Depending on the type of bird, the males and females don’t always arrive together. I’ve noticed this with the red-winged blackbird. Although, the first birds to arrive, the mallards (ducks), come in pairs (selection of a partner took place the prior fall) and they arrive in February. For some birds, it takes time for their mating plumage to show fully (some of their feather colors change to enhance the attraction). Once both males and females have arrived and the plumage is in full color, some species go through a process of male sparring to show off to the females their prowess at protecting a nest. Again, I’ve seen this with the red-winged blackbird. Then the selection of a partner takes place. The nest-building begins and takes time as well. But certainly for some birds like the mallards, this begins in February. I have photos of mallard pairs in February and then by the first days of May, their ducklings are trailing behind them! Thank you for sharing this article. Loved it! Wonderful new take. I had no idea. New take on Valentine’s Day for the readers! Here’s a whole post containing new knowledge, and relevant for today as well! This was great, and I love the discussion about birds in the comments. So many interesting and smart people out there. Very interesting connection. Thanks for sharing! Thank you, Interesting Literature, and happy Valentine’s Day! Thank you for the information, I had no idea about the origins of Valentines Day. great background data – in the post AND in the comments!! enjoyed this much. ~y. I, too, was interested in researching Valentines Day, but not its origins. I investigated how it is celebrated across the globe. If you do the same you will discover that it is not always celebrated on Feb. 14.